This guide is intended for users who use Magnum to deploy and manage clusters of hosts for a Container Orchestration Engine. It describes the infrastructure that Magnum creates and how to work with them. Section 1-3 describe Magnum itself, including an overview, the CLI and Horizon interface. Section 4-9 describe the Container Orchestration Engine (COE) supported along with a guide on how to select one that best meets your needs and how to develop a driver for a new COE. Section 10-15 describe the low level OpenStack infrastructure that is created and managed by Magnum to support the COE’s. Magnum is an OpenStack API service developed by the OpenStack Containers Team making container orchestration engines (COE) such as Docker Swarm, Kubernetes and Apache Mesos available as the first class resources in OpenStack. Magnum uses Heat to orchestrate an OS image which contains Docker and COE and runs that image in either virtual machines or bare metal in a cluster configuration. Magnum offers complete life-cycle management of COEs in an OpenStack environment, integrated with other OpenStack services for a seamless experience for OpenStack users who wish to run containers in an OpenStack environment. A ClusterTemplate (previously known as BayModel) is a collection of parameters to describe how a cluster can be constructed. Some parameters are relevant to the infrastructure of the cluster, while others are for the particular COE. In a typical workflow, a user would create a ClusterTemplate, then create one or more clusters using the ClusterTemplate. A cloud provider can also define a number of ClusterTemplates and provide them to the users. A ClusterTemplate cannot be updated or deleted if a cluster using this ClusterTemplate still exists. The definition and usage of the parameters of a ClusterTemplate are as follows. They are loosely grouped as: mandatory, infrastructure, COE specific. Name of the ClusterTemplate to create. The name does not have to be unique. If multiple ClusterTemplates have the same name, you will need to use the UUID to select the ClusterTemplate when creating a cluster or updating, deleting a ClusterTemplate. If a name is not specified, a random name will be generated using a string and a number, for example “pi-13-model”. Specify the Container Orchestration Engine to use. Supported COE’s include ‘kubernetes’, ‘swarm’, ‘mesos’. If your environment has additional cluster drivers installed, refer to the cluster driver documentation for the new COE names. This is a mandatory parameter and there is no default value. This is a mandatory parameter and there is no default value. Note that the os_distro attribute is case sensitive. The name of the SSH keypair to configure in the cluster servers for ssh access. You will need the key to be able to ssh to the servers in the cluster. The login name is specific to the cluster driver. If keypair is not provided in template it will be required at Cluster create. This value will be overridden by any keypair value that is provided during Cluster create. The name or network ID of a Neutron network to provide connectivity to the external internet for the cluster. This network must be an external network, i.e. its attribute ‘router:external’ must be ‘True’. The servers in the cluster will be connected to a private network and Magnum will create a router between this private network and the external network. This will allow the servers to download images, access discovery service, etc, and the containers to install packages, etc. In the opposite direction, floating IP’s will be allocated from the external network to provide access from the external internet to servers and the container services hosted in the cluster. This is a mandatory parameter and there is no default value. --public Access to a ClusterTemplate is normally limited to the admin, owner or users within the same tenant as the owners. Setting this flag makes the ClusterTemplate public and accessible by other users. The default is not public. The servers in the cluster can be VM or baremetal. This parameter selects the type of server to create for the cluster. The default is ‘vm’. Possible values are ‘vm’, ‘bm’. Note that the network driver name is case sensitive. Note that the volume driver name is case sensitive. The DNS nameserver for the servers and containers in the cluster to use. This is configured in the private Neutron network for the cluster. The default is ‘8.8.8.8’. The nova flavor id for booting the node servers. The default is ‘m1.small’. This value can be overridden at cluster creation. The nova flavor id for booting the master or manager servers. The default is ‘m1.small’. This value can be overridden at cluster creation. The IP address for a proxy to use when direct http access from the servers to sites on the external internet is blocked. This may happen in certain countries or enterprises, and the proxy allows the servers and containers to access these sites. The format is a URL including a port number. The default is ‘None’. The IP address for a proxy to use when direct https access from the servers to sites on the external internet is blocked. This may happen in certain countries or enterprises, and the proxy allows the servers and containers to access these sites. The format is a URL including a port number. The default is ‘None’. When a proxy server is used, some sites should not go through the proxy and should be accessed normally. In this case, you can specify these sites as a comma separated list of IP’s. The default is ‘None’. If specified, container images will be stored in a cinder volume of the specified size in GB. Each cluster node will have a volume attached of the above size. If not specified, images will be stored in the compute instance’s local disk. For the ‘devicemapper’ storage driver, must specify volume and the minimum value is 3GB. For the ‘overlay’ and ‘overlay2’ storage driver, the minimum value is 1GB or None(no volume). This value can be overridden at cluster creation. The name of a driver to manage the storage for the images and the container’s writable layer. The default is ‘devicemapper’. Arbitrary labels in the form of key=value pairs. The accepted keys and valid values are defined in the cluster drivers. They are used as a way to pass additional parameters that are specific to a cluster driver. Refer to the subsection on labels for a list of the supported key/value pairs and their usage. The value can be overridden at cluster creation. --tls-disabled Transport Layer Security (TLS) is normally enabled to secure the cluster. In some cases, users may want to disable TLS in the cluster, for instance during development or to troubleshoot certain problems. Specifying this parameter will disable TLS so that users can access the COE endpoints without a certificate. The default is TLS enabled. Docker images by default are pulled from the public Docker registry, but in some cases, users may want to use a private registry. This option provides an alternative registry based on the Registry V2: Magnum will create a local registry in the cluster backed by swift to host the images. Refer to Docker Registry 2.0 for more details. The default is to use the public registry. Since multiple masters may exist in a cluster, a load balancer is created to provide the API endpoint for the cluster and to direct requests to the masters. In some cases, such as when the LBaaS service is not available, this option can be set to ‘false’ to create a cluster without the load balancer. In this case, one of the masters will serve as the API endpoint. The default is ‘true’, i.e. to create the load balancer for the cluster. Labels is a general method to specify supplemental parameters that are specific to certain COE or associated with certain options. Their format is key/value pair and their meaning is interpreted by the drivers that uses them. The drivers do validate the key/value pairs. Their usage is explained in details in the appropriate sections, however, since there are many possible labels, the following table provides a summary to help give a clearer picture. The label keys in the table are linked to more details elsewhere in the user guide. A cluster (previously known as bay) is an instance of the ClusterTemplate of a COE. Magnum deploys a cluster by referring to the attributes defined in the particular ClusterTemplate as well as a few additional parameters for the cluster. Magnum deploys the orchestration templates provided by the cluster driver to create and configure all the necessary infrastructure. When ready, the cluster is a fully operational COE that can host containers. The infrastructure of the cluster consists of the resources provided by the various OpenStack services. Existing infrastructure, including infrastructure external to OpenStack, can also be used by the cluster, such as DNS, public network, public discovery service, Docker registry. The actual resources created depends on the COE type and the options specified; therefore you need to refer to the cluster driver documentation of the COE for specific details. For instance, the option ‘–master-lb-enabled’ in the ClusterTemplate will cause a load balancer pool along with the health monitor and floating IP to be created. It is important to distinguish resources in the IaaS level from resources in the PaaS level. For instance, the infrastructure networking in OpenStack IaaS is different and separate from the container networking in Kubernetes or Swarm PaaS. Typical infrastructure includes the following. The servers host the containers in the cluster and these servers can be VM or bare metal. VM’s are provided by Nova. Since multiple VM’s are hosted on a physical server, the VM’s provide the isolation needed for containers between different tenants running on the same physical server. Bare metal servers are provided by Ironic and are used when peak performance with virtually no overhead is needed for the containers. Keystone provides the authentication and authorization for managing the cluster infrastructure. Networking among the servers is provided by Neutron. Since COE currently are not multi-tenant, isolation for multi-tenancy on the networking level is done by using a private network for each cluster. As a result, containers belonging to one tenant will not be accessible to containers or servers of another tenant. Other networking resources may also be used, such as load balancer and routers. Networking among containers can be provided by Kuryr if needed. Cinder provides the block storage that can be used to host the containers and as persistent storage for the containers. Barbican provides the storage of secrets such as certificates used for Transport Layer Security (TLS) within the cluster. The set of life cycle operations on the cluster is one of the key value that Magnum provides, enabling clusters to be managed painlessly on OpenStack. The current operations are the basic CRUD operations, but more advanced operations are under discussion in the community and will be implemented as needed. NOTE The OpenStack resources created for a cluster are fully accessible to the cluster owner. Care should be taken when modifying or reusing these resources to avoid impacting Magnum operations in unexpected manners. For instance, if you launch your own Nova instance on the cluster private network, Magnum would not be aware of this instance. Therefore, the cluster-delete operation will fail because Magnum would not delete the extra Nova instance and the private Neutron network cannot be removed while a Nova instance is still attached. NOTE Currently Heat nested templates are used to create the resources; therefore if an error occurs, you can troubleshoot through Heat. For more help on Heat stack troubleshooting, refer to the Troubleshooting Guide. NOTE bay-<command> are the deprecated versions of these commands and are still support in current release. They will be removed in a future version. Any references to the term bay will be replaced in the parameters when using the ‘bay’ versions of the commands. For example, in ‘bay-create’ –baymodel is used as the baymodel parameter for this command instead of –cluster-template. The ‘cluster-create’ operation is asynchronous; therefore you can initiate another ‘cluster-create’ operation while the current cluster is being created. If the cluster fails to be created, the infrastructure created so far may be retained or deleted depending on the particular orchestration engine. As a common practice, a failed cluster is retained during development for troubleshooting, but they are automatically deleted in production. The current cluster drivers use Heat templates and the resources of a failed ‘cluster-create’ are retained. Name of the cluster to create. If a name is not specified, a random name will be generated using a string and a number, for example “gamma-7-cluster”. The ID or name of the ClusterTemplate to use. This is a mandatory parameter. Once a ClusterTemplate is used to create a cluster, it cannot be deleted or modified until all clusters that use the ClusterTemplate have been deleted. The name of the SSH keypair to configure in the cluster servers for ssh access. You will need the key to be able to ssh to the servers in the cluster. The login name is specific to the cluster driver. If keypair is not provided it will attempt to use the value in the ClusterTemplate. If the ClusterTemplate is also missing a keypair value then an error will be returned. The keypair value provided here will override the keypair value from the ClusterTemplate. The number of servers that will serve as node in the cluster. The default is 1. The number of servers that will serve as master for the cluster. The default is 1. Set to more than 1 master to enable High Availability. If the option ‘–master-lb-enabled’ is specified in the ClusterTemplate, the master servers will be placed in a load balancer pool. In this case, Magnum will generate a unique url here for each cluster and store the info for the servers. The timeout for cluster creation in minutes. The value expected is a positive integer and the default is 60 minutes. If the timeout is reached during cluster-create, the operation will be aborted and the cluster status will be set to ‘CREATE_FAILED’. The properties include those not specified by users that have been assigned default values and properties from new resources that have been created for the cluster. The parameters are positional and their definition and usage are as follows. This is the first parameter, specifying the UUID or name of the cluster to update. This is the second parameter, specifying the desired change to be made to the cluster attributes. The allowed changes are ‘add’, ‘replace’ and ‘remove’. This is the third parameter, specifying the targeted attributes in the cluster as a list separated by blank space. To add or replace an attribute, you need to specify the value for the attribute. To remove an attribute, you only need to specify the name of the attribute. Currently the only attribute that can be replaced or removed is ‘node_count’. The attributes ‘name’, ‘master_count’ and ‘discovery_url’ cannot be replaced or delete. The table below summarizes the possible change to a cluster. The ‘cluster-update’ operation cannot be initiated when another operation is in progress. NOTE: The attribute names in cluster-update are slightly different from the corresponding names in the cluster-create command: the dash ‘-‘ is replaced by an underscore ‘_’. For instance, ‘node-count’ in cluster-create is ‘node_count’ in cluster-update. When some nodes are removed, Magnum will attempt to find nodes with no containers to remove. If some nodes with containers must be removed, Magnum will log a warning message. The only parameter for the cluster-delete command is the ID or name of the cluster to delete. Multiple clusters can be specified, separated by a blank space. If the operation fails, there may be some remaining resources that have not been deleted yet. In this case, you can troubleshoot through Heat. If the templates are deleted manually in Heat, you can delete the cluster in Magnum to clean up the cluster from Magnum database. The ‘cluster-delete’ operation can be initiated when another operation is still in progress. Refer to the OpenStack Command-Line Interface Reference for a full list of the commands supported by the openstack coe command-line client. Magnum provides a Horizon plugin so that users can access the Container Infrastructure Management service through the OpenStack browser-based graphical UI. The plugin is available from magnum-ui. It is not installed by default in the standard Horizon service, but you can follow the instruction for installing a Horizon plugin. Sign a user key and obtain a signed certificate for accessing the secured COE API endpoint in a cluster. Other operations are not yet supported and the CLI should be used for these. Following is the screenshot of the Horizon view showing the list of cluster templates. Following is the screenshot of the Horizon view showing the details of a cluster template. Following is the screenshot of the dialog to create a new cluster. Magnum is designed to accommodate new cluster drivers to support custom COE’s and this section describes how a new cluster driver can be constructed and enabled in Magnum. Python code that implements the controller operations for the particular COE. The driver must implement: Currently supported: cluster_create, cluster_update, cluster_delete. A directory of orchestration templates for managing the lifecycle of clusters, including creation, configuration, update, and deletion. Currently only Heat templates are supported, but in the future other orchestration mechanism such as Ansible may be supported. Python code that maps the parameters from the ClusterTemplate to the input parameters for the orchestration and invokes the orchestration in the templates directory. Tracks the latest version of the driver in this directory. This is defined by a version attribute and is represented in the form of 1.0.0. It should also include a Driver attribute with descriptive name such as fedora_swarm_atomic. Instructions for obtaining or building an image suitable for the COE. Python code to interface with the COE. Python code to monitor the resource utilization of the cluster. Python code to scale the cluster by adding or removing nodes. To help developers in creating new COE drivers, a minimal cluster driver is provided as an example. The ‘docker’ cluster driver will simply deploy a single VM running Ubuntu with the latest Docker version installed. It is not a true cluster, but the simplicity will help to illustrate the key concepts. Heat Stack template - The HOT file that Magnum will use to generate a cluster using a Heat Stack. Template definition - Magnum’s interface for interacting with the Heat template. Definition Entry Point - Used to advertise the available Cluster Types. The Heat Stack Template is where most of the real work happens. The result of the Heat Stack Template should be a full Container Orchestration Environment. Template definitions are a mapping of Magnum object attributes and Heat template parameters, along with Magnum consumable template outputs. A Cluster Type Definition indicates which Cluster Types it can provide. Cluster Types are how Magnum determines which of the enabled Cluster Type Definitions it will use for a given cluster. Entry points are a standard discovery and import mechanism for Python objects. Each Template Definition should have an Entry Point in the magnum.template_definitions group. This example exposes it’s Template Definition as example_template = example_template:ExampleTemplate in the magnum.template_definitions group. Because Cluster Type Definitions are basically Python projects, they can be worked with like any other Python project. They can be cloned from version control and installed or uploaded to a package index and installed via utilities such as pip. Heat Stack Templates are what Magnum passes to Heat to generate a cluster. For each ClusterTemplate resource in Magnum, a Heat stack is created to arrange all of the cloud resources needed to support the container orchestration environment. These Heat stack templates provide a mapping of Magnum object attributes to Heat template parameters, along with Magnum consumable stack outputs. Magnum passes the Heat Stack Template to the Heat service to create a Heat stack. The result is a full Container Orchestration Environment. Magnum supports a variety of COE options, and allows more to be added over time as they gain popularity. As an operator, you may choose to support the full variety of options, or you may want to offer a subset of the available choices. Given multiple choices, your users can run one or more clusters, and each may use a different COE. For example, I might have multiple clusters that use Kubernetes, and just one cluster that uses Swarm. All of these clusters can run concurrently, even though they use different COE software. Choosing which COE to use depends on what tools you want to use to manage your containers once you start your app. If you want to use the Docker tools, you may want to use the Swarm cluster type. Swarm will spread your containers across the various nodes in your cluster automatically. It does not monitor the health of your containers, so it can’t restart them for you if they stop. It will not automatically scale your app for you (as of Swarm version 1.2.2). You may view this as a plus. If you prefer to manage your application yourself, you might prefer swarm over the other COE options. Kubernetes (as of v1.2) is more sophisticated than Swarm (as of v1.2.2). It offers an attractive YAML file description of a pod, which is a grouping of containers that run together as part of a distributed application. This file format allows you to model your application deployment using a declarative style. It has support for auto scaling and fault recovery, as well as features that allow for sophisticated software deployments, including canary deploys and blue/green deploys. Kubernetes is very popular, especially for web applications. Apache Mesos is a COE that has been around longer than Kubernetes or Swarm. It allows for a variety of different frameworks to be used along with it, including Marathon, Aurora, Chronos, Hadoop, and a number of others. The Apache Mesos framework design can be used to run alternate COE software directly on Mesos. Although this approach is not widely used yet, it may soon be possible to run Mesos with Kubernetes and Swarm as frameworks, allowing you to share the resources of a cluster between multiple different COEs. Until this option matures, we encourage Magnum users to create multiple clusters, and use the COE in each cluster that best fits the anticipated workload. Finding the right COE for your workload is up to you, but Magnum offers you a choice to select among the prevailing leading options. Once you decide, see the next sections for examples of how to create a cluster with your desired COE. This is the orchestration or management level such as Kubernetes, Swarm, Mesos and its frameworks. This is the low level container operation. Currently it is Docker for all clusters. The clients can be CLI and/or browser-based. You will need to refer to the documentation for the specific native client and appropriate version for details, but following are some pointers for reference. For Swarm, the main CLI is ‘docker’, along with associated tools such as ‘docker-compose’, etc. Specific version of the binaries can be obtained from the Docker Engine installation. Mesos cluster uses the Marathon framework and details on the Marathon UI can be found in the section Using Marathon. Kubernetes uses a range of terminology that we refer to in this guide. We define these common terms in the Glossary for your reference. Specified in the cluster-create command to indicate how many servers will run as master in the cluster. Having more than one will provide high availability. The masters will be in a load balancer pool and the virtual IP address (VIP) of the load balancer will serve as the Kubernetes API endpoint. For external access, a floating IP associated with this VIP is available and this is the endpoint shown for Kubernetes in the ‘cluster-show’ command. Specified in the cluster-create command to indicate how many servers will run as node in the cluster to host the users’ pods. The nodes are registered in Kubernetes using the Nova instance name. Specified in the ClusterTemplate to select the network driver. The supported and default network driver is ‘flannel’, an overlay network providing a flat network for all pods. Refer to the Networking section for more details. Specified in the ClusterTemplate to select the volume driver. The supported volume driver is ‘cinder’, allowing Cinder volumes to be mounted in containers for use as persistent storage. Data written to these volumes will persist after the container exits and can be accessed again from other containers, while data written to the union file system hosting the container will be deleted. Refer to the Storage section for more details. Specified in the ClusterTemplate to select the Docker storage driver. The default is ‘devicemapper’. Refer to the Storage section for more details. Transport Layer Security is enabled by default, so you need a key and signed certificate to access the Kubernetes API and CLI. Magnum handles its own key and certificate when interfacing with the Kubernetes cluster. In development mode, TLS can be disabled. Refer to the ‘Transport Layer Security’_ section for more details. The servers for Kubernetes master host containers in the ‘kube-system’ name space to run the Kubernetes proxy, scheduler and controller manager. The masters will not host users’ pods. Kubernetes API server, docker daemon, etcd and flannel run as systemd services. The servers for Kubernetes node also host a container in the ‘kube-system’ name space to run the Kubernetes proxy, while Kubernetes kubelet, docker daemon and flannel run as systemd services. You can log into the master servers using the login ‘fedora’ and the keypair specified in the ClusterTemplate. In addition to the common attributes in the ClusterTemplate, you can specify the following attributes that are specific to Kubernetes by using the labels attribute. This label corresponds to Kubernetes parameter for the API server ‘–admission-control’. For more details, refer to the Admission Controllers. The default value corresponds to the one recommended in this doc for our current Kubernetes version. This label sets the size of a volume holding the etcd storage data. The default value is 0, meaning the etcd data is not persisted (no volume). This label allows users to select a specific Kubernetes release, based on its container tag. If unset, the current Magnum version’s default Kubernetes release is installed. This label triggers the deployment of the kubernetes dashboard. The default value is 1, meaning it will be enabled. This label enables the kubernetes certificate manager api. This label can hold any additional options to be passed to the kubelet. For more details, refer to the kubelet admin guide. By default no additional options are passed. This label can hold any additional options to be passed to the kube proxy. For more details, refer to the kube proxy admin guide. By default no additional options are passed. This label can hold any additional options to be passed to the kube controller manager. For more details, refer to the kube controller manager admin guide. By default no additional options are passed. This label can hold any additional options to be passed to the kube api server. For more details, refer to the kube api admin guide. By default no additional options are passed. This label can hold any additional options to be passed to the kube scheduler. For more details, refer to the kube scheduler admin guide. By default no additional options are passed. 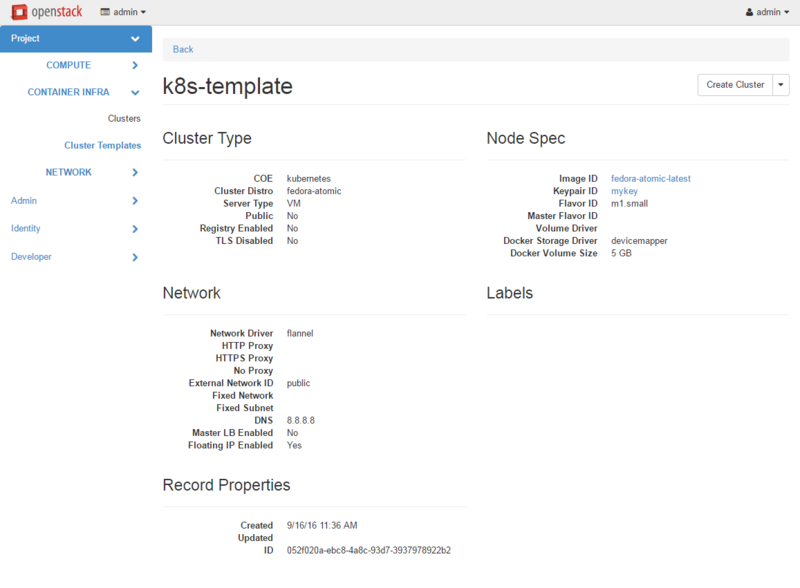 The kubernetes dashboard comes with heapster enabled. If this label is set, an influxdb and grafana instance will be deployed, heapster will push data to influx and grafana will project them. This label tells kubelet which Cgroup driver to use. Ideally this should be identical to the Cgroup driver that Docker has been started with. If this label is set to True, Kubernetes will support use Keystone for authorization and authentication. All Kubernetes pods and services created in the cluster are assigned IP addresses on a private container network so they can access each other and the external internet. However, these IP addresses are not accessible from an external network. To publish a service endpoint externally so that the service can be accessed from the external network, Kubernetes provides the external load balancer feature. This is done by simply specifying in the service manifest the attribute “type: LoadBalancer”. Magnum enables and configures the Kubernetes plugin for OpenStack so that it can interface with Neutron and manage the necessary networking resources. When the service is created, Kubernetes will add an external load balancer in front of the service so that the service will have an external IP address in addition to the internal IP address on the container network. The service endpoint can then be accessed with this external IP address. Kubernetes handles all the life cycle operations when pods are modified behind the service and when the service is deleted. Refer to the Kubernetes External Load Balancer section for more details. In addition to the LoadBalancer described above, Kubernetes can also be configured with an Ingress Controller. Ingress can provide load balancing, SSL termination and name-based virtual hosting. Magnum allows selecting one of multiple controller options via the ‘ingress_controller’ label. Check the Kubernetes documentation to define your own Ingress resources. This lable is not used for octavia-ingress-controller. CoreDNS is a critical service in Kubernetes cluster for service discovery. To get high availability for CoreDNS pod for Kubernetes cluster, now Magnum supports the autoscaling of CoreDNS using cluster-proportional-autoscaler. With cluster-proportional-autoscaler, the replicas of CoreDNS pod will be autoscaled based on the nodes and cores in the clsuter to prevent single point failure. The scaling parameters and data points are provided via a ConfigMap to the autoscaler and it refreshes its parameters table every poll interval to be up to date with the latest desired scaling parameters. Using ConfigMap means user can do on-the-fly changes(including control mode) without rebuilding or restarting the scaler containers/pods. Please refer Autoscale the DNS Service in a Cluster for more info. Now cloud-provider-openstack provides a good webhook between OpenStack Keystone and Kubernetes, so that user can do authorization and authentication with a Keystone user/role against the Kubernetes cluster. If label keystone-auth-enabled is set True, then user can use their OpenStack credentials and roles to access resources in Kubernetes. NOTE: Please make sure the version of kubectl is 1.8+ and make sure OS_DOMAIN_NAME is included in the rc file. Now try kubectl get pods , you should be able to see response from Kubernetes based on current user’s role. Please refer the doc of k8s-keystone-auth in cloud-provider-openstack for more information. There are two types of servers in the Swarm cluster: managers and nodes. The Docker daemon runs on all servers. On the servers for manager, the Swarm manager is run as a Docker container on port 2376 and this is initiated by the systemd service swarm-manager. Etcd is also run on the manager servers for discovery of the node servers in the cluster. On the servers for node, the Swarm agent is run as a Docker container on port 2375 and this is initiated by the systemd service swarm-agent. On start up, the agents will register themselves in etcd and the managers will discover the new node to manage. Specified in the cluster-create command to indicate how many servers will run as managers in the cluster. Having more than one will provide high availability. The managers will be in a load balancer pool and the load balancer virtual IP address (VIP) will serve as the Swarm API endpoint. A floating IP associated with the load balancer VIP will serve as the external Swarm API endpoint. The managers accept the standard Docker API and perform the corresponding operation on the servers in the pool. For instance, when a new container is created, the managers will select one of the servers based on some strategy and schedule the containers there. Specified in the cluster-create command to indicate how many servers will run as nodes in the cluster to host your Docker containers. These servers will register themselves in etcd for discovery by the managers, and interact with the managers. Docker daemon is run locally to host containers from users. Specified in the ClusterTemplate to select the network driver. The supported drivers are ‘docker’ and ‘flannel’, with ‘docker’ as the default. With the ‘docker’ driver, containers are connected to the ‘docker0’ bridge on each node and are assigned local IP address. With the ‘flannel’ driver, containers are connected to a flat overlay network and are assigned IP address by Flannel. Refer to the Networking section for more details. Specified in the ClusterTemplate to select the volume driver to provide persistent storage for containers. The supported volume driver is ‘rexray’. The default is no volume driver. When ‘rexray’ or other volume driver is deployed, you can use the Docker ‘volume’ command to create, mount, unmount, delete volumes in containers. Cinder block storage is used as the backend to support this feature. Refer to the Storage section for more details. Transport Layer Security is enabled by default to secure the Swarm API for access by both the users and Magnum. You will need a key and a signed certificate to access the Swarm API and CLI. Magnum handles its own key and certificate when interfacing with the Swarm cluster. In development mode, TLS can be disabled. Refer to the ‘Transport Layer Security’_ section for details on how to create your key and have Magnum sign your certificate. You can log into the manager and node servers with the account ‘fedora’ and the keypair specified in the ClusterTemplate. In addition to the common attributes in the ClusterTemplate, you can specify the following attributes that are specific to Swarm by using the labels attribute. A Mesos cluster consists of a pool of servers running as Mesos slaves, managed by a set of servers running as Mesos masters. Mesos manages the resources from the slaves but does not itself deploy containers. Instead, one of more Mesos frameworks running on the Mesos cluster would accept user requests on their own endpoint, using their particular API. These frameworks would then negotiate the resources with Mesos and the containers are deployed on the servers where the resources are offered. There are two types of servers in the Mesos cluster: masters and slaves. The Docker daemon runs on all servers. On the servers for master, the Mesos master is run as a process on port 5050 and this is initiated by the upstart service ‘mesos-master’. Zookeeper is also run on the master servers, initiated by the upstart service ‘zookeeper’. Zookeeper is used by the master servers for electing the leader among the masters, and by the slave servers and frameworks to determine the current leader. The framework Marathon is run as a process on port 8080 on the master servers, initiated by the upstart service ‘marathon’. On the servers for slave, the Mesos slave is run as a process initiated by the upstart service ‘mesos-slave’. Specified in the cluster-create command to indicate how many servers will run as masters in the cluster. Having more than one will provide high availability. If the load balancer option is specified, the masters will be in a load balancer pool and the load balancer virtual IP address (VIP) will serve as the Mesos API endpoint. A floating IP associated with the load balancer VIP will serve as the external Mesos API endpoint. Specified in the cluster-create command to indicate how many servers will run as Mesos slave in the cluster. Docker daemon is run locally to host containers from users. The slaves report their available resources to the master and accept request from the master to deploy tasks from the frameworks. In this case, the tasks will be to run Docker containers. Specified in the ClusterTemplate to select the network driver. Currently ‘docker’ is the only supported driver: containers are connected to the ‘docker0’ bridge on each node and are assigned local IP address. Refer to the Networking section for more details. This is currently not supported for Mesos. Specified in the ClusterTemplate to indicate the image to boot the servers for the Mesos master and slave. The image binary is loaded in Glance with the attribute ‘os_distro = ubuntu’. You can download the ready-built image, or you can create the image as described below in the Building Mesos image section. Transport Layer Security is currently not implemented yet for Mesos. You can log into the manager and node servers with the account ‘ubuntu’ and the keypair specified in the ClusterTemplate. In addition to the common attributes in the baymodel, you can specify the following attributes that are specific to Mesos by using the labels attribute. When the volume driver ‘rexray’ is used, you can mount a data volume backed by Cinder to a host to be accessed by a container. In this case, the label ‘rexray_preempt’ can optionally be set to True or False to enable any host to take control of the volume regardless of whether other hosts are using the volume. This will in effect unmount the volume from the current host and remount it on the new host. If this label is set to false, then rexray will ensure data safety for locking the volume before remounting. The default value is False. By default the executor will inherit the slave’s environment variables. The cluster driver provides two ways to create this image, as follows. $ sudo docker build -t magnum/mesos-builder . Magnum uses TLS to secure communication between a cluster’s services and the outside world. TLS is a complex subject, and many guides on it exist already. This guide will not attempt to fully describe TLS, but instead will only cover the necessary steps to get a client set up to talk to a cluster with TLS. A more in-depth guide on TLS can be found in the OpenSSL Cookbook by Ivan Ristić. By the end-user when they use the native client libraries to interact with the cluster. This applies to both a CLI or a program that uses a client for the particular cluster. Each client needs a valid certificate to authenticate and communicate with a cluster. The first two cases are implemented internally by Magnum and are not exposed to the users, while the last case involves the users and is described in more details below. For cluster type with TLS support, e.g. Kubernetes and Swarm, TLS is enabled by default. To disable TLS in Magnum, you can specify the parameter ‘–tls-disabled’ in the ClusterTemplate. Please note it is not recommended to disable TLS due to security reasons. In the following example, Kubernetes is used to illustrate a secure cluster, but the steps are similar for other cluster types that have TLS support. You can see the api_address contains https in the URL, showing that the Kubernetes services are configured securely with SSL certificates and now any communication to kube-apiserver will be over https. There are two ways to obtain these 3 artifacts. You can now use the native client to interact with the COE. The variables and artifacts are unique to the cluster. Directory to save the certificate and config files. --force Overwrite existing files in the directory specified. You can create the key and certificates manually using the following steps. This command generates a 4096 byte RSA key at key.pem. You can then open http://localhost:8001/ui in your browser. Magnum generates and maintains a certificate for each cluster so that it can also communicate securely with the cluster. As a result, it is necessary to store the certificates in a secure manner. Magnum provides the following methods for storing the certificates and this is configured in /etc/magnum/magnum.conf in the section [certificates] with the parameter ‘cert_manager_type’. This is the recommended configuration for a production environment. Magnum will interface with Barbican to store and retrieve certificates, delegating the task of securing the certificates to Barbican. This storage mode is only as secure as the controller server that hosts the database for the OpenStack services. Note that this mode is only supported when there is a single Magnum conductor running since the certificates are stored locally. The ‘local’ mode is not recommended for a production environment. For the nodes, the certificates for communicating with the masters are stored locally and the nodes are assumed to be secured. There are two components that make up the networking in a cluster. The Neutron infrastructure for the cluster: this includes the private network, subnet, ports, routers, load balancers, etc. The networking model presented to the containers: this is what the containers see in communicating with each other and to the external world. Typically this consists of a driver deployed on each node. The two components are deployed and managed separately. The Neutron infrastructure is the integration with OpenStack; therefore, it is stable and more or less similar across different COE types. The networking model, on the other hand, is specific to the COE type and is still under active development in the various COE communities, for example, Docker libnetwork and Kubernetes Container Networking. As a result, the implementation for the networking models is evolving and new models are likely to be introduced in the future. The external Neutron network ID to connect to this cluster. This is used to connect the cluster to the external internet, allowing the nodes in the cluster to access external URL for discovery, image download, etc. If not specified, the default value is “public” and this is valid for a typical devstack. The Neutron network to use as the private network for the cluster nodes. If not specified, a new Neutron private network will be created. The DNS nameserver to use for this cluster. This is an IP address for the server and it is used to configure the Neutron subnet of the cluster (dns_nameservers). If not specified, the default DNS is 8.8.8.8, the publicly available DNS. The proxy for the nodes in the cluster, to be used when the cluster is behind a firewall and containers cannot access URL’s on the external internet directly. For the parameter http-proxy and https-proxy, the value to provide is a URL and it will be set in the environment variable HTTP_PROXY and HTTPS_PROXY respectively in the nodes. For the parameter no-proxy, the value to provide is an IP or list of IP’s separated by comma. Likewise, the value will be set in the environment variable NO_PROXY in the nodes. If not specified, the default driver is Flannel for Kubernetes, and Docker for Swarm and Mesos. Particular network driver may require its own set of parameters for configuration, and these parameters are specified through the labels in the ClusterTemplate. Labels are arbitrary key=value pairs. IPv4 network in CIDR format to use for the entire Flannel network. If not specified, the default is 10.100.0.0/16. The size of the subnet allocated to each host. If not specified, the default is 24. The type of backend for Flannel. Possible values are udp, vxlan, host-gw. If not specified, the default is udp. Selecting the best backend depends on your networking. Generally, udp is the most generally supported backend since there is little requirement on the network, but it typically offers the lowest performance. The vxlan backend performs better, but requires vxlan support in the kernel so the image used to provision the nodes needs to include this support. The host-gw backend offers the best performance since it does not actually encapsulate messages, but it requires all the nodes to be on the same L2 network. The private Neutron network that Magnum creates does meet this requirement; therefore if the parameter fixed_network is not specified in the ClusterTemplate, host-gw is the best choice for the Flannel backend. IPv4 network in CIDR format which is the IP pool, from which Pod IPs will be chosen. If not specified, the default is 192.168.0.0/16. Besides, the Calico network driver needs kube_tag with v1.9.3 or later, because Calico needs extra mounts for the kubelet container. See commit of atomic-system-containers for more information. NOTE: We have seen some issues using systemd as cgroup-driver with Calico together, so we highly recommend to use cgroupfs as the cgroup-driver for Calico. Create private networks but do not assign floating IPs With this approach the cluster will be inaccessible from the outside. The user can add a floating ip to access it, but the certificates will not work. Create a private network and a LoadBalancer for the master node(s) There are two type of loadbalancers in magnum, one for the api and one for the services running on the nodes. For kubernetes LoadBalancer service type see: Kubernetes External Load Balancer. Not recommended when using only a single master node as it will add 2 amphora vms: one for the kube API and another for etcd thus being more expensive. All the above can also work by passing an existing private network instead of creating a new one using –fixed-network and –fixed-subnet. When using flannel, the backend should be ‘host-gw’ if performance is a requirement, ‘udp’ is too slow and ‘vxlan’ creates one more overlay network on top of the existing neutron network. On the other hand, in a flat network one should use ‘vxlan’ for network isolation. Calico allows users to setup network policies in kubernetes policies for network isolation. Support for highly available clusters is a work in progress, the goal being to enable clusters spanning multiple availability zones. As of today you can specify one single availability zone for you cluster. The availability zone where the cluster nodes should be deployed. If not specified, the default is None. Set periodic_global_stack_list in magnum.conf to True ( False by default). Since this is an active area of development, a complete solution covering all issues does not exist yet, but partial solutions are emerging. Scaling containers involves managing the number of instances of the container by replicating or deleting instances. This can be used to respond to change in the workload being supported by the application; in this case, it is typically driven by certain metrics relevant to the application such as response time, etc. Other use cases include rolling upgrade, where a new version of a service can gradually be scaled up while the older version is gradually scaled down. Scaling containers is supported at the COE level and is specific to each COE as well as the version of the COE. You will need to refer to the documentation for the proper COE version for full details, but following are some pointers for reference. For Kubernetes, pods are scaled manually by setting the count in the replication controller. Kubernetes version 1.3 and later also supports autoscaling. For Docker, the tool ‘Docker Compose’ provides the command docker-compose scale which lets you manually set the number of instances of a container. For Swarm version 1.12 and later, services can also be scaled manually through the command docker service scale. Automatic scaling for Swarm is not yet available. Mesos manages the resources and does not support scaling directly; instead, this is provided by frameworks running within Mesos. With the Marathon framework currently supported in the Mesos cluster, you can use the scale operation on the Marathon UI or through a REST API call to manually set the attribute ‘instance’ for a container. Refer to the section Scale lifecycle operation for more details. Adding nodes to a cluster is straightforward: Magnum deploys additional VMs or baremetal servers through the heat templates and invokes the COE-specific mechanism for registering the new nodes to update the available resources in the cluster. Afterward, it is up to the COE or user to re-balance the workload by launching new container instances or re-launching dead instances on the new nodes. Magnum scans the pods in the namespace ‘Default’ to determine the nodes that are not hosting any (empty nodes). If the number of nodes to be removed is equal or less than the number of these empty nodes, these nodes will be removed from the cluster. If the number of nodes to be removed is larger than the number of empty nodes, a warning message will be sent to the Magnum log and the empty nodes along with additional nodes will be removed from the cluster. The additional nodes are selected randomly and the pods running on them will be deleted without warning. For this reason, a good practice is to manage the pods through the replication controller so that the deleted pods will be relaunched elsewhere in the cluster. Note also that even when only the empty nodes are removed, there is no guarantee that no pod will be deleted because there is no locking to ensure that Kubernetes will not launch new pods on these nodes after Magnum has scanned the pods. No node selection heuristic is currently supported. If you decrease the node_count, a node will be chosen by magnum without consideration of what containers are running on the selected node. Magnum scans the running tasks on Marathon server to determine the nodes on which there is no task running (empty nodes). If the number of nodes to be removed is equal or less than the number of these empty nodes, these nodes will be removed from the cluster. If the number of nodes to be removed is larger than the number of empty nodes, a warning message will be sent to the Magnum log and the empty nodes along with additional nodes will be removed from the cluster. The additional nodes are selected randomly and the containers running on them will be deleted without warning. Note that even when only the empty nodes are removed, there is no guarantee that no container will be deleted because there is no locking to ensure that Mesos will not launch new containers on these nodes after Magnum has scanned the tasks. Currently, scaling containers and scaling cluster nodes are handled separately, but in many use cases, there are interactions between the two operations. For instance, scaling up the containers may exhaust the available resources in the cluster, thereby requiring scaling up the cluster nodes as well. Many complex issues are involved in managing this interaction. A presentation at the OpenStack Tokyo Summit 2015 covered some of these issues along with some early proposals, Exploring Magnum and Senlin integration for autoscaling containers. This remains an active area of discussion and research. Currently Cinder provides the block storage to the containers, and the storage is made available in two ways: as ephemeral storage and as persistent storage. The filesystem for the container consists of multiple layers from the image and a top layer that holds the modification made by the container. This top layer requires storage space and the storage is configured in the Docker daemon through a number of storage options. When the container is removed, the storage allocated to the particular container is also deleted. Magnum can manage the containers’ filesystem in two ways, storing them on the local disk of the compute instances or in a separate Cinder block volume for each node in the cluster, mounts it to the node and configures it to be used as ephemeral storage. Users can specify the size of the Cinder volume with the ClusterTemplate attribute ‘docker-volume-size’. Currently the block size is fixed at cluster creation time, but future lifecycle operations may allow modifying the block size during the life of the cluster. For drivers that support additional volumes for container storage, a label named ‘docker_volume_type’ is exposed so that users can select different cinder volume types for their volumes. The default volume must be set in ‘default_docker_volume_type’ in the ‘cinder’ section of magnum.conf, an obvious value is the default volume type set in cinder.conf of your cinder deployment . Please note, that docker_volume_type refers to a cinder volume type and it is unrelated to docker or kubernetes volumes. Both local disk and the Cinder block storage can be used with a number of Docker storage drivers available. ‘devicemapper’: When used with a dedicated Cinder volume it is configured using direct-lvm and offers very good performance. If it’s used with the compute instance’s local disk uses a loopback device offering poor performance and it’s not recommended for production environments. Using the ‘devicemapper’ driver does allow the use of SELinux. ‘overlay’ When used with a dedicated Cinder volume offers as good or better performance than devicemapper. If used on the local disk of the compute instance (especially with high IOPS drives) you can get significant performance gains. However, for kernel versions less than 4.9, SELinux must be disabled inside the containers resulting in worse container isolation, although it still runs in enforcing mode on the cluster compute instances. In some use cases, data read/written by a container needs to persist so that it can be accessed later. To persist the data, a Cinder volume with a filesystem on it can be mounted on a host and be made available to the container, then be unmounted when the container exits. Docker provides the ‘volume’ feature for this purpose: the user invokes the ‘volume create’ command, specifying a particular volume driver to perform the actual work. Then this volume can be mounted when a container is created. A number of third-party volume drivers support OpenStack Cinder as the backend, for example Rexray and Flocker. Magnum currently supports Rexray as the volume driver for Swarm and Mesos. Other drivers are being considered. Kubernetes allows a previously created Cinder block to be mounted to a pod and this is done by specifying the block ID in the pod YAML file. When the pod is scheduled on a node, Kubernetes will interface with Cinder to request the volume to be mounted on this node, then Kubernetes will launch the Docker container with the proper options to make the filesystem on the Cinder volume accessible to the container in the pod. When the pod exits, Kubernetes will again send a request to Cinder to unmount the volume’s filesystem, making it available to be mounted on other nodes. Following are some examples for using Cinder as persistent storage. NOTE: This feature requires Kubernetes version 1.5.0 or above. The public Fedora image from Atomic currently meets this requirement. Kubernetes is now ready to use Cinder for persistent storage. Following is an example illustrating how Cinder is used in a pod. The command will generate the volume with a ID. The volume ID will be specified in Step 2. You can start a shell in the container to check that the mountPath exists, and on an OpenStack client you can run the command ‘cinder list’ to verify that the cinder volume status is ‘in-use’. You can log into the container to check that the mountPath exists, and you can run the command ‘cinder list’ to verify that your cinder volume status is ‘in-use’. Heat templates to orchestrate the configuration. Template definition to map ClusterTemplate parameters to Heat template parameters. Set of scripts to configure software. Collectively, they constitute the driver for a particular COE and a particular distro; therefore, developing a new image needs to be done in conjunction with developing these other components. Image can be built by various methods such as diskimagebuilder, or in some case, a distro image can be used directly. A number of drivers and the associated images is supported in Magnum as reference implementation. In this section, we focus mainly on the supported images. Additional software are described as follows. The login for this image is fedora. The login for this image is core. This image is built manually using diskimagebuilder. The scripts and instructions are included in Magnum code repo. Currently Ironic is not fully supported yet, therefore more details will be provided when this driver has been fully tested. This image is the same as the image for Kubernetes on Fedora Atomic described above. The login for this image is fedora. This image is built manually using diskimagebuilder. The instructions are provided in the section Diskimage-builder. The Fedora site hosts the current image ubuntu-mesos-latest.qcow2. Magnum provides notifications about usage data so that 3rd party applications can use the data for auditing, billing, monitoring, or quota purposes. This document describes the current inclusions and exclusions for Magnum notifications. Magnum uses Cloud Auditing Data Federation (CADF) Notification as its notification format for better support of auditing, details about CADF are documented below. Magnum uses the PyCADF library to emit CADF notifications, these events adhere to the DMTF CADF specification. This standard provides auditing capabilities for compliance with security, operational, and business processes and supports normalized and categorized event data for federation and aggregation. OBSERVER The RESOURCE that generates the CADF Event Record based on its observation (directly or indirectly) of the Actual Event. INITIATOR The RESOURCE that initiated, originated, or instigated the event’s ACTION, according to the OBSERVER. ACTION The operation or activity the INITIATOR has performed, has attempted to perform or has pending against the event’s TARGET, according to the OBSERVER. TARGET The RESOURCE against which the ACTION of a CADF Event Record was performed, attempted, or is pending, according to the OBSERVER. OUTCOME The result or status of the ACTION against the TARGET, according to the OBSERVER. Additionally there may be extra keys present depending on the operation being performed, these will be discussed below. The following table displays the corresponding relationship between resource types and operations. The bay type is deprecated and will be removed in a future version. Cluster is the new equivalent term. The following is an example of a notification that is sent when a cluster is created. This example can be applied for any create, update or delete event that is seen in the table above. The <action> and typeURI fields will be change. This label accepts a boolean value. If True, the monitoring stack will be setup. By default prometheus_monitoring = False. This label lets users create their own admin user password for the Grafana interface. It expects a string value. By default it is set to admin. By default, all Kubernetes clusters already contain cAdvisor integrated with the Kubelet binary. Its container monitoring data can be accessed on a node level basis through http://NODE_IP:4194. Node Exporter is part of the above mentioned monitoring stack as it can be used to export machine metrics. Such functionality also work on a node level which means that when prometheus_monitoring is True, the Kubernetes nodes will be populated with an additional manifest under /etc/kubernetes/manifests. Node Exporter is then automatically picked up and launched as a regular Kubernetes POD. To aggregate and complement all the existing monitoring metrics and add a built-in visualization layer, Prometheus is used. It is launched by the Kubernetes master node(s) as a Service within a Deployment with one replica and it relies on a ConfigMap where the Prometheus configuration (prometheus.yml) is defined. This configuration uses Prometheus native support for service discovery in Kubernetes clusters, kubernetes_sd_configs. The respective manifests can be found in /srv/kubernetes/monitoring/ on the master nodes and once the service is up and running, Prometheus UI can be accessed through port 9090. Finally, for custom plotting and enhanced metric aggregation and visualization, Prometheus can be integrated with Grafana as it provides native compliance for Prometheus data sources. Also Grafana is deployed as a Service within a Deployment with one replica. The default user is admin and the password is setup according to grafana_admin_passwd. There is also a default Grafana dashboard provided with this installation, from the official Grafana dashboards’ repository. The Prometheus data source is automatically added to Grafana once it is up and running, pointing to http://prometheus:9090 through Proxy. The respective manifests can also be found in /srv/kubernetes/monitoring/ on the master nodes and once the service is running, the Grafana dashboards can be accessed through port 3000. For both Prometheus and Grafana, there is an assigned systemd service called kube-enable-monitoring. To publish a service endpoint externally so that the service can be accessed from the external network, Kubernetes provides the external load balancer feature. This is done by simply specifying the attribute “type: LoadBalancer” in the service manifest. When the service is created, Kubernetes will add an external load balancer in front of the service so that the service will have an external IP address in addition to the internal IP address on the container network. The service endpoint can then be accessed with this external IP address. Refer to the Kubernetes service document for more details.